Email blasts are dead. Email marketing, on the other hand, is very much alive and thriving. In fact, it may be the most powerful tool to drive conversions. Does that seem like a contradiction? Email marketing, at its best, is about making connections with your audience. It’s not a “blast” you send to a mass of faceless people. But how do you transform your “email blasts” into personal, quality emails that build relationships with your audience? In this article, I’ll explain how you can use email to truly connect and build meaningful relationships — and boost sales! Your subscribers join your email list to get something of value — an answer to a question, a solution to a problem, information or even entertainment. The more you give them, the more they’ll trust and rely on you. And once you’ve given them that value, they’ll be more likely to do something for you in return. In the book Influence: The Psychology of Persuasion, Robert Cialdini calls this the theory of reciprocity — when people feel indebted to someone who gives them something. There are quite a few ways you can give information and value to your subscribers. Once someone joins your list, send them your latest blog posts in a weekly newsletter or email automation series to provide valuable information. Or, consider giving people a free lead magnet or incentive in exchange for their email address. The benefits of this are two-fold. One, more people will fill out your sign up form. And two, it’s a great opportunity to kickoff your relationship with subscribers by giving them content they love. For example, I work for AWeber, an email marketing platform that helps 100,000+ customers send awesome emails. Our customers often tell us they struggle with writer’s block and don’t know what to write in their emails. To resolve that issue for our audience and grow our list, we created What to Write, a free 7-day email course and guide that includes more than 20 fill-in-the-blank email templates. (Side note: If you want this course, you can get it here - registration required.) After people subscribe for the course, the first email they receive includes the templates and guide we promised. But on top of that, we share two additional, relevant blog posts to give subscribers more value. Sending the wrong message to the wrong person can really hurt your email engagement and your ability to build relationships with subscribers. It’s like a door-to-door steak salesman trying to sell meat to a vegetarian. Annoying? Yes. When you send irrelevant messages to a subscriber, they may feel like you’re wasting their time — which can lead to disengagement, unsubscribes and spam complaints. To avoid sending irrelevant emails, try segmenting your audience and sending them targeted messages. Segmentation is when your filter your subscribers into a group based on a unifying factor, such as their geographic location, interests, an action they took or skill level. This allows you to then send a targeted message by emailing relevant content to this segmented group. Since I live in Pennsylvania, this email was relevant to me and immediately caught my attention. 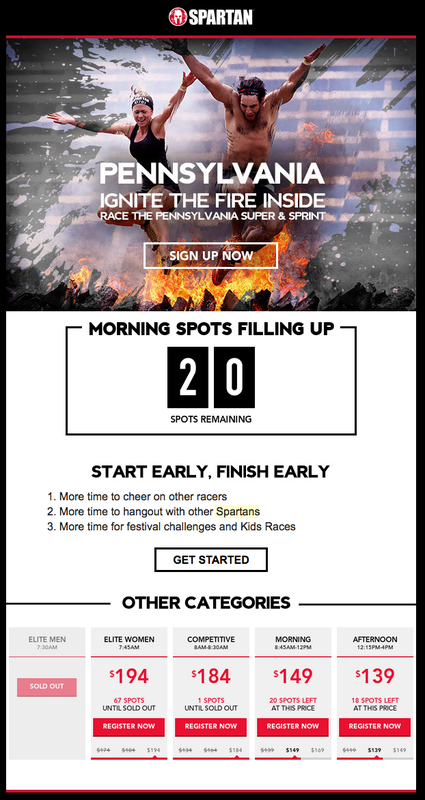 Once I opened it, the headline “Pennsylvania Ignite the Fire Inside” continued to address me on a personal level. This segmentation convinced me to open and read this email and likely increased engagement for everyone who received it. 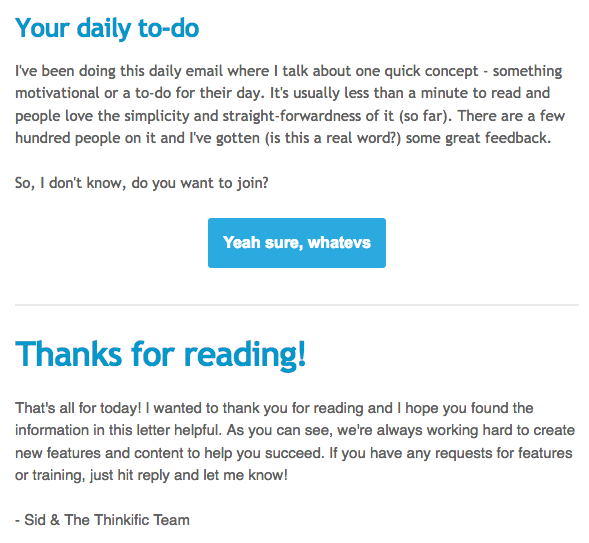 A welcome email is a message you create and set up to automatically send to subscribers when they sign up to your list. Welcome emails get four times higher open rates and fives times higher click-through rates compared to other emails. They’re also an important part of building relationships with your subscribers and increasing engagement for future emails. 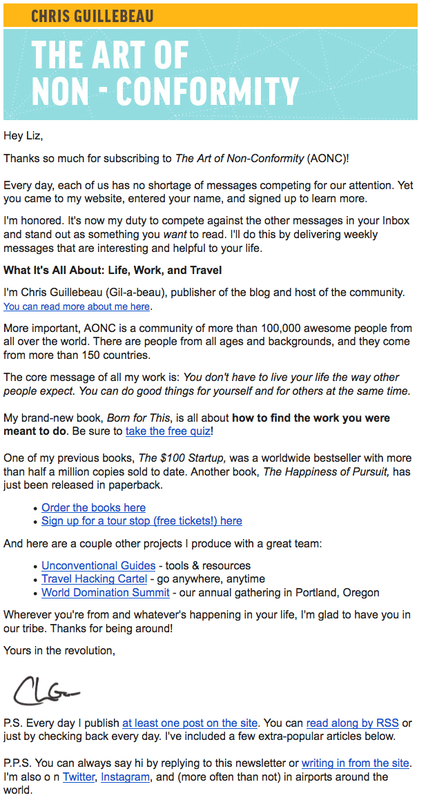 Let’s take a look at this welcome email from Chris Guillebeau of the Art to Non-Conformity. In this email, Chris thanks his subscriber, sets expectations, explains who he is and shares more resources. This email lets subscribers know they successfully joined his list, and sets the tone for future messages. Additionally, it gets people excited for his next email. One of the worst things you can do in any relationship is not listen. And this applies to building a relationship with your subscribers as well. Receiving and responding to feedback from your audience is an invaluable way to deepen your relationship with them because it allows you to send even more valuable content in the future. So how exactly can you get feedback? Or, email your subscribers a survey. 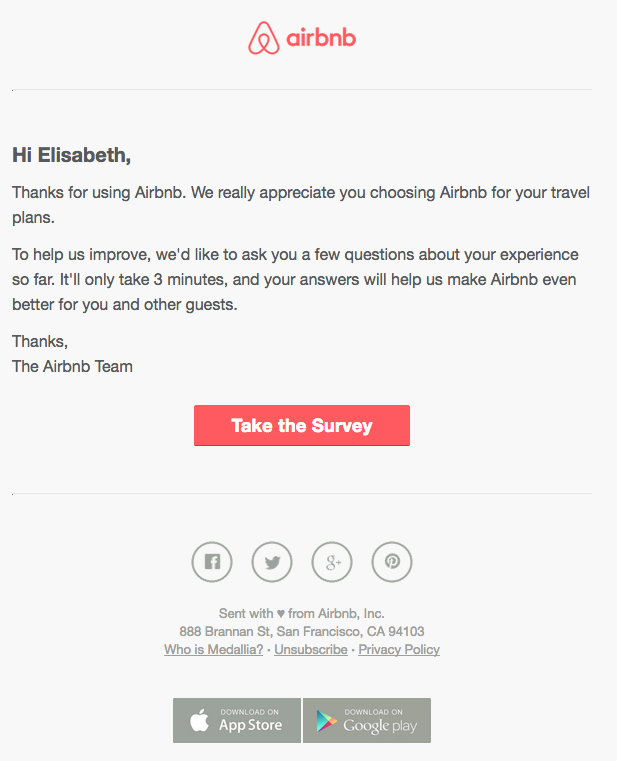 In the example below, Airbnb shares a survey with an eye-catching call-to-action button and mentions how easy it is to complete. Asking subscribers to give you feedback by responding to your emails or completing a survey are great ways to learn how you can improve your emails and offers. And when your emails are better, you’ll be able to build stronger relationships with subscribers. Once you receive feedback, however, make sure you listen and take action. Your subscribers will love you even more for it! Ultimately, there’s one rule you can follow to make sure your emails build connections with your audience: give them value. Your subscribers should love your emails so much that they’d never consider unsubscribing or marking you as spam. Instead, they should look forward to the next time one of your emails lands in their inbox. By delivering content subscribers will love, segmenting your audience, welcoming them to your list and listening to their feedback, you’ll avoid blasting your subscribers with emails they don’t want. A version of this post was originally published on the AWeber blog.